There are 2 issues to consider when cleaning produce: first, removing pesticides from store-bought non-organic fruits & vegetables and second, cleaning bacteria, worms and pests from organic produce. Both require separate instructions for how to best clean. This is really important for someone eating a high raw food diet because most of your food will be in the raw, uncooked natural state! Washing produce is especially important for people eating a high raw food diet. Always use a dedicated bucket used only for cleaning your fruits and veggies. That means, do NOT use the same bucket to wash laundry or anything else. You do not want to re-contaminate your food with more chemicals! If you use chemicals to wash your sink then do NOT clean your produce in the sink. Use a clean bucket instead. I have a small bucket and a large bucket so if I buy a small amount of produce, I can always use the smaller bucket. On big shopping days, I use the large one. The biggest issue with organic produce is unwanted pests like worms and parasites, and even worse, their microscopic eggs. Several times I’ve cut open a head of raw organic cabbage and found live worms inside. This is the reality of eating organic! What can I say, the bugs have good taste in food! This is how nature intended it. Interestingly enough, when I soak my produce as explained below, I will sometimes see worms or slugs float to the surface of the water and then it’s easy to scoop them out. For organic produce, fill your bucket with water, fill it with fruits and veggies and add 20-30 drops of Grapefruit Seed Extract (GSE) to the water for a large-size bucket. In a small bucket, you can add 12-15 drops. Let it sit for 10 minutes and rinse. GSE is fantastic for killing fungus and bacteria and is not in any way harmful to you. In fact, it’s very good for you! GSE is available at any local health food store or can be purchased easily online. Once you get into the habit of doing this, it becomes an easy part of your routine. I like to wash everything as soon as I get home before I put it in the fridge so I don’t get lazy and forget to do it later. Especially for raw foodists, it is essential to wash your produce correctly. I learned the hard way and wound up with 21 feet of intestinal roundworms, which in part was from 3 years on a raw food diet without cleaning my produce properly. To simply rinse with water is not enough – this will not kill the unwanted microbes. I highly recommend Activated Charcoal Powder to pull the chemical pesticides out of your non-organic produce. This is how it’s done: Fill your bucket with water and add 2 tsp. of loose “activated charcoal powder” (in Thailand this is sold in health food stores specially as a vegetable cleaner). 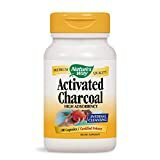 In the USA, I was able to find medicinal-grade loose Activate Charcoal Powder online. The other option is to use 3-4 capsules of Activate Charcoal Powder into your water. The capsules can be found at any local health food store on online at vitacost.com. 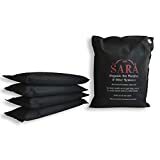 You do NOT want to use charcoal brickets or burnt toast – this is not activated charcoal and will not work (I actually had a client whose naturopath told her to do that, unreal!). Soak all fruits and veggies for 10 minutes in the charcoal/water mixture, then rinse. When I’ve done this in Thailand, I was amazed to see all of my produce come back to life – everything looked fresher and the veggies seemed to stay fresher, longer in the refrigerator. Please note: I have seen some websites that wrongfully promote Grapefruit Seed Extract (GSE) as a way to pull pesticides from produce. While GSE is great for killing bugs and harmful bacteria, it does NOT remove pesticides out of fruit and vegetables. Activated Charcoal is an absorbing agent, like a sponge; while GSE is a cleaner of bacteria. Ideally, if you have the time and patience, you should first soak your non-organic produce in a Charcoal/Water mixture for 10 minutes, rinse, and then soak in 12-15 drops of GSE/water mixture for 10 minutes to clean any bacteria and parasite eggs. Organic Food is the best food ever, and even better when it’s cleaned well! • Lemon Bath– Fill Sink (or bucket) with cold water, add 4 tbsp. salt and the juice of one lemon. Soak for 10 minutes then rinse under cold water. (Can also substitute lemon with ¼ cup of raw apple cider vinegar). • Clorox Bath– Use 1 teaspoon Clorox bleach per gallon of water. Let produce sit in bath for 5-10 minutes. Drain; soak again in fresh water for 5 minutes. (Remember, there is chlorine in your drinking water. This is how many undeveloped nations wash their produce). • HCL Bath– Pour one ounce hydrochloric acid into 3 quarts water. This is equivalent to 1% solution. Soak for 5-10 minutes and rinse. (Use only food-grade quality HCL). From all of these options, I use the Grapefruit Seed Extract (GSE) to wash my produce. If the produce is not organic, I normally still just use the GSE. 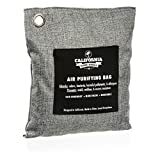 In rare cases when I know the food is over-sprayed with chemicals like in Panama, I will use the Activated Charcoal Powder. When traveling, I carry a small bowl, colander and a bottle of GSE so I still can wash my produce on the road. Genetically Engineered Food – No more Frankenfoods! Recipe: Raw Tahini, Garlic and Lemon Salad Dressing or Veggie Dip…and it’s Amazing! What are Irradiated Foods? What you don’t know CAN hurt you! Another reason to Avoid Processed Food – e.coli in Nestle cookies!